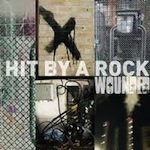 ‘Wounded’ is the debut album by well-respected soundtrack composer, producer and re-mixer Jim Wheeler. Opening up with ‘Black Lilly, White Lotus’, is an intriguing blend of Susheela Raman’s vocal works, woven into tight precise beat structures and lighter shades of dub-step; albeit the production is slightly less invasive and far more appealing than the genre tag just given. There is something disturbingly commercial about this album rearing its head now and again that normally I would run from; however, there is a fine balance to the tightrope that Wheeler walks on and he reins it in to his own blend of eclecticism and that’s why this release should appeal to a whole host of different listeners. A clever use of reggae influences filter through a lot of the electronics and blended with subtle attention to harmonies and cut and paste scraping beat-work, none more so than on the drifting ‘Two Face’ which is a prime example of such an approach. It’s hard to compare HBAR to many artists a lot of readers on here would be aware of, but ‘Surgery’ is somewhat reminiscent of Mothboy’s works with Akira the Don and it’s definitely an area of the album that I appreciated the most, with guttersnipe vocalisations and hook-line rhythm sections that snap out the lyrics with brutal conviction; more of this please. ‘Wounded’ is a solid album through and through and whilst there could be more variation, this rolls from track one to twelve seamlessly and is best consumed as a whole.